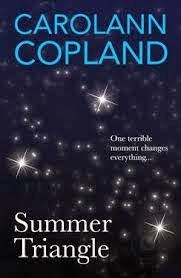 I'm really looking forward to launching Carolann Copland's debut novel SUMMER TRIANGLE on the 29th October at Carousel Creates - a beautiful writing retreat in the Dublin Mountains. I had the pleasure of receiving an advance copy of this interesting novel which digs deep, exploring youthful idealism across a backdrop of Islamic Fundamentalists. Cultural divisions and differences are teased out through an array of characters from a young mother seeking escape through alcohol to a grieving and impressionable teenage boy. When 08/08 threatens to become Dublin’s very own 9/11 will a chance meeting of the two teenagers hasten their road to self-destruction or help them rise from the ashes of the past?